Do you often buy & then lose your small skews or drills? Do you often keep your tools here & there and keep searching your entire house? Then, a good quality toolbag can come to your rescue! If you possess all the required tools starting from a hammer to a clamp, then a tool bag is a must for you. 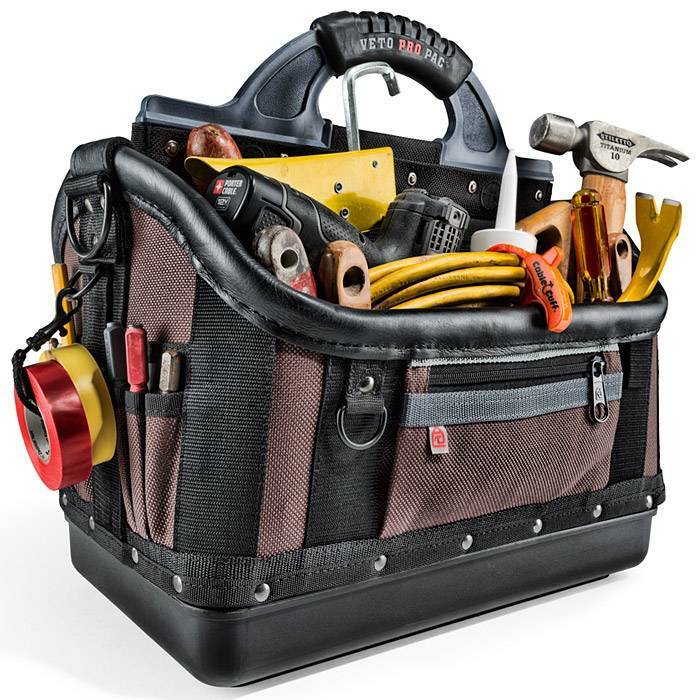 Investing in a well made and portable toolbag can be handy to organize your numerous tools effectively. It will also help you carry them from one place to another conveniently. Often tools get missing at the time of need, hence keeping them collectively in one bag will allow you to find the required tool at ease. So, are you now thinking of buying one for you? Then, go through the tips below as it will give you a brief idea about what to ideally look for in selecting the best tool bags for you or your loved ones. Keep an eye on the arrangement! If you have a large variety of tools, then keeping them in one place is essential to make them reachable. Hence, the first thing to consider while buying a toolbag is its inside arrangement. This will include various pockets, spaces and how well they are organized inside the bag. Various pockets and clips of different types & sizes will be handy to keep small as well as large tools. Also, don’t forget to look for D-rings in your toolbag. The more organized the toolbag is, the more convenient it will prove to be. 2. Select the correct size. The size of the toolbag will matter a lot in choosing the best tool bags. If the size is too large, it will be difficult for you to carry the same from one place to another. At the same time, if the bag is too small it will not carry all your essentials. Hence choose the suitable size that meets your requirement keeping in mind the convenience and portability. The weight should also play an important role in determining your toolbag. Since the tools will have their own individual weight, choosing a heavy bag will only add extra weights to your hands. Hence, opt for a lightweight bag instead of heavy ones for a hassle-free experience. 3. Durability is the king. While investing in a good toolbag, always keep in mind to check its durability. The durability and strength of the bag will directly depend on the constituting material of the same. Mostly, such bags consist of canvas, nylon etc. The bag will hardly last long if the constituting material is of inferior quality. So, always make sure to check the quality of the same before purchasing your toolbag. 4. Price makes or breaks the deal! The price is a crucial element to look for in your dream toolbag. It is quite evident that the quality of the bag will directly reflect in the price. But spending too much on your tool bag will be a bad decision if you are not a professional. There are different types of toolbags available in the market. Ranging from high brands to lesser known brands- there is a wide variety to choose from. A branded purchase does not always bring value to the table. Hence, balancing the two aspects- price and value are of utmost importance. 5. Handles are a must. This point is often missed while purchasing any bag. A handle is essential for carrying your heavy tools as it can comfort your hands and provide you with better hold. A textured handle is what you should look for in your toolbag for a tight grip. The padded handles are also comfortable to hold. Overall, a handle makes a great difference in your toolbag. So always try to choose one that comes with it. One of the key features to look for in a toolbag is how well its zips are embedded. It is extremely important to check the zips properly before buying. Sometimes the zips can be damaged or malfunctioning at the time of purchase itself. The credibility and reliability should be checked to avoid hassle later on. Also look for zipper compartments in the bag. The more such compartments, the better the storage. 7. Do NOT avoid the base. The most underrated and overlooked part of a toolbag is its base. Like any other bag, the base is the foundation of a toolbag. Since you will store various heavy tools inside, it is mandatory to check the base of the toolbag while purchasing. Only a bag with a strong base will last longer and provide the stronghold that is required to retain the tools. Hence, choose a base that is conveniently welded rather than stitched. This will make sure the tools do not come into the contact of water even if the bag is accidentally kept on water patches. This will prevent the tools from rusting. A toolbag is essential to store your everyday tools conveniently in one place. While toolbox is also preferred by many, toolbag is more convenient in terms of portability. From tote to shoulder toolbag, from backpack to holdall toolbag, there is a wide range available in the market to meet your needs. The features mentioned above must be checked and taken into consideration if you are thinking of buying one for you. These will indeed help you find the most suitable one in less time and effort giving you the true value for the money spent. She is a blogger who loves to write in different verticals. She co-authored Supercharge Organic Traffic: A popular course focusing on Organic Traffic for E-commerce. Her hobbies are traveling and reading. Want to know Daily Makeup Routine of Victoria Secret Models?